A property in the First Creek neighborhood came on the market in May of 2017 and I jumped on it like white on rice! I am intimately familiar with First Creek, owning 3 properties there myself and having closed 15 deals in the complex since January, 2016. It’s a newer development of condos and townhomes that was built in two phases, 2006 and 2010. It went through a lawsuit with KB Homes starting around 2012 and won a multi-million dollar construction defect settlement in March, 2016. The settlement will fund a huge amount of improvements to be made on the grounds and properties. Critical to me is that the defects were non-structural. They were a lot of sub contractor mistakes like putting in the wrong insulation on some roofs and siding, issues with some of the street construction, etc. I’m not an engineer but reading the copious reports on the construction issues nothing overly worried me, they’re repairs that will be made to rectify all the sloppy work done originally. The HOA is also flush with cash and is well run (they put a large portion of the settlement directly into their operating account to pay the account back for years of work it had done before to remedy issues that needed immediate attention). I love the complex. 5771 Ceylon St. originally came on the market at $255k. It went under contract in 5 days but the investor ended up backing out, not sure why. A question I get from a lot of my investors is, "is it a problem buying a property someone else has already broken a contract on?" Does it suggest some unknown issue with the property? Should we shy away from deals that previously fell through? My answer is that it’s usually very difficult to know why a buyer pulls out of a contract so speculating on why is generally a waste of time. More importantly, we’ll have every opportunity to do a complete analysis of the property ourselves. We need to control what we can control, not speculate (probably incorrectly) on why another buyer chose not to close on a property. 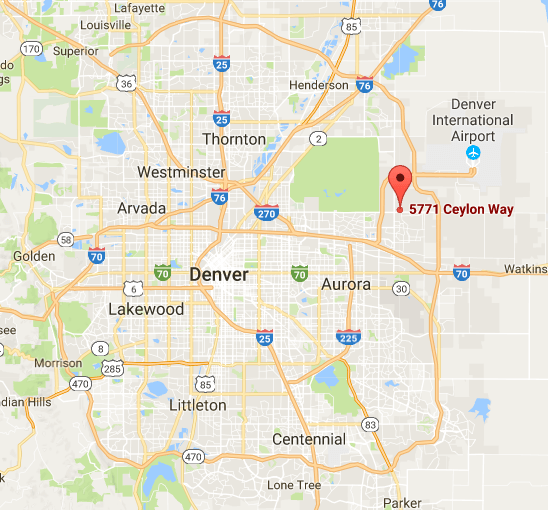 Given the extremely buyer friendly State of Colorado DORA contracts, buyers are very well protected. We just need to do our research, due diligence, analytical analysis, and physical inspections to make sure this is the right property for us. 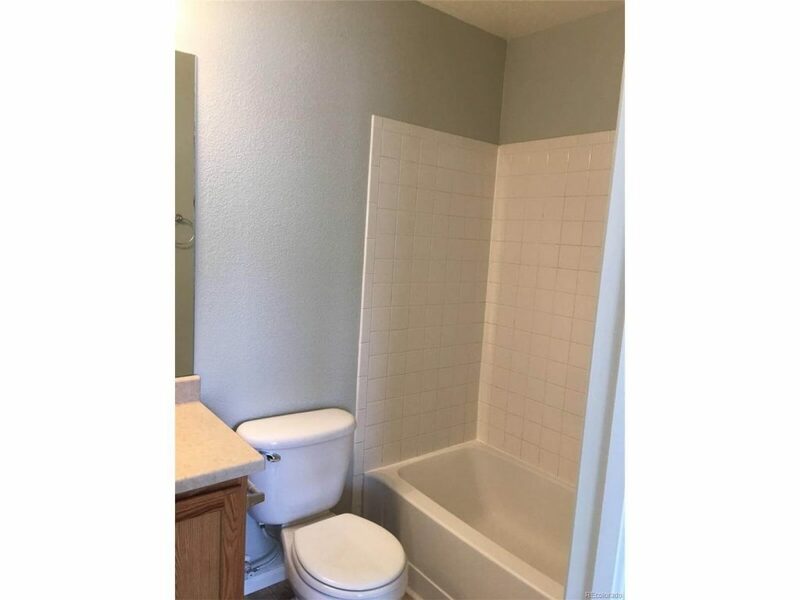 So I am not worried about picking up a property that another buyer passed on because I’ll never really know why they did. What I care about is finding the right property for the buyer and doing all the analysis during the under contract period to ensure it meets our financial and physical requirements. After the previous deal fell through the listing agent put it back on the market for $240,000, a major price drop. Clearly, he wanted to move it very quickly. We took a look at the property as soon as it was back on the market and liked everything about it. It had been a rental previously so wasn’t in pristine condition, but it was close. Maybe an A- if not an actual A. With a little cleaning it was ready to rent. 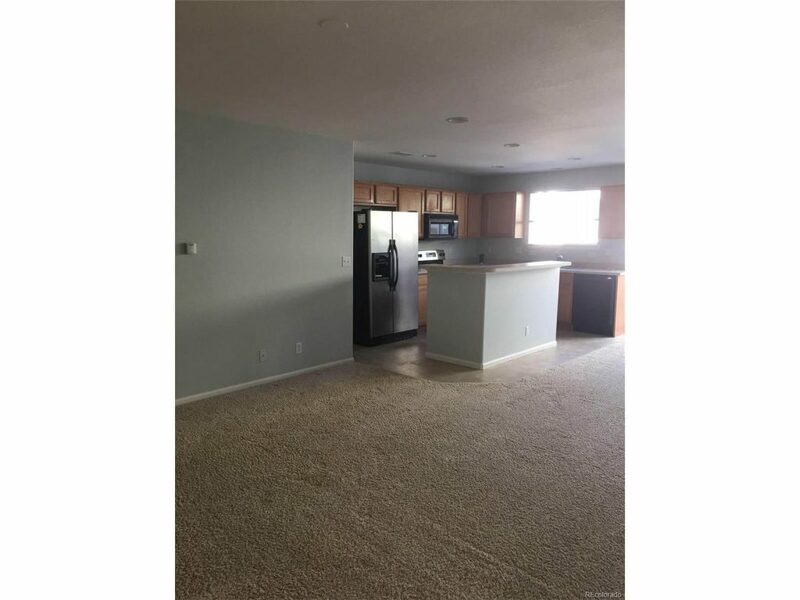 I had spent several weeks with my client looking at dozens of properties so he had a very good perspective on where this property fit in in the current metro Denver market. He’d heard me talk a lot about this complex and why I liked it so much. So, after walking through the property for 5 minutes he was ready to pull the trigger. Then came the inevitable discussion of what to offer. It’s such a strong seller’s market and we’ve been turned down so often before my buyer was willing to be aggressive on this one. So my next step was to call the listing agent. The good news was that the listing agent was a buddy of mine, a terrific agent with several years experience that I’ve done deals with in the past. I called him up and discussed the property and the strengths of my buyer. He was glad to hear from me and let me know there were several offers above asking price already on the property – no surprise there! We discussed what the seller was looking for (pretty much price, terms and quick closing like most sellers) and I let him know we would put in an offer later that day. He did a great job answering all my question, representing his seller and trying to work the best deal possible for his client. We're working with an excellent local lender that I use and the listing agent has also used in the past (I can’t over emphasize the importance of using a good local lender in competitive bids). A solid offer no doubt, but certainly not guaranteed to be chosen. I presented the offer to the listing agent who let me know he had several offers like this and would let me know what the seller decided. He said he’d put a good word in for his past experiences with me as an agent (and investor) and the lender. 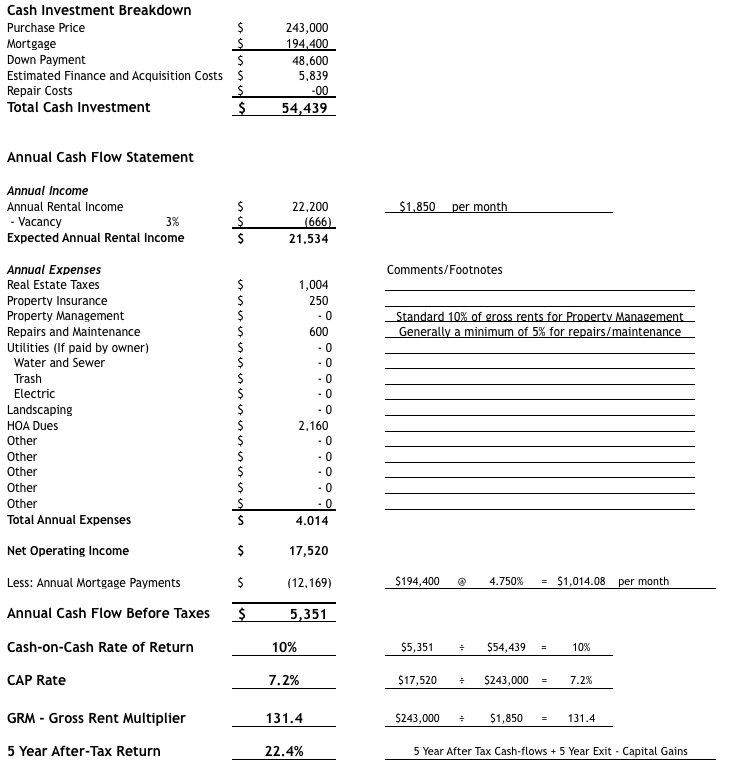 At $247,000 with a projected $1,850 rent, our real estate investment spreadsheet calculated the property had a 7.2 cap rate. Not a home run but a solid single. We like to get typically 7.3 – 7.8 caps in today’s metro Denver market so this was a little low. But we know the complex so well, it has so much money in the HOA, millions of dollars from the lawsuit settlement are going into improving the complex and the properties are like new. We’re ok with a 7.2 cap when everything else looks so good. The next day we got word that our offer was selected! We were really happy to hear that and jumped on the inspection right away, setting it up immediately. We engaged a professional inspector to do a full inspection on the property. One of the reasons I like the First Creek complex so much is that in 15 previous inspections I and my clients have had there we’ve had exactly one Inspection Objection item, a really incredible record (I think we wanted the furnace to be cleaned). There were a couple of extremely minor items that we did not to ask to be addressed. All good so far. In the meantime, the buyer met with his lender (a close colleague of mine and a terrific Loan Officer) and got the underwriting process started. The buyer was already fully prequalified so the good news is there’s nothing much to talk about regarding the loan. The buyer gave the lender everything required, it went through underwriting and we got a clear-to-close 22 days after going under contract. There was one hiccup we needed to deal with during the loan process, though. The appraisal came back at $239,000, fully $8,000 below the contract price. This is not uncommon in an environment where prices are leaping upward. Appraisals are by definition backward looking analyses. They use sold comps to project current property values. When prices rise very quickly it can be difficult for an appraiser to use historical sold comps to set a value and this is exactly what happened in this situation. I sent the appraisal immediately to the buyer and listing agent and let them know the situation. I spoke to the buyer first. He said he’d be glad to buy the property for $239,000 but wasn’t interested in coming to the table with almost $8,000 more dollars and closing at $247,000. What Happens When An Appraisal Comes in Low? Quick aside, here’s what happens when an appraisal comes in below contract price. The lender will loan on the lower of either the contract price or the appraised value. So if the appraisal came in at $247,000, the lender would have loaned 80% of $247,000 = $197,600. The buyer would bring the difference to the closing table of $49,400. 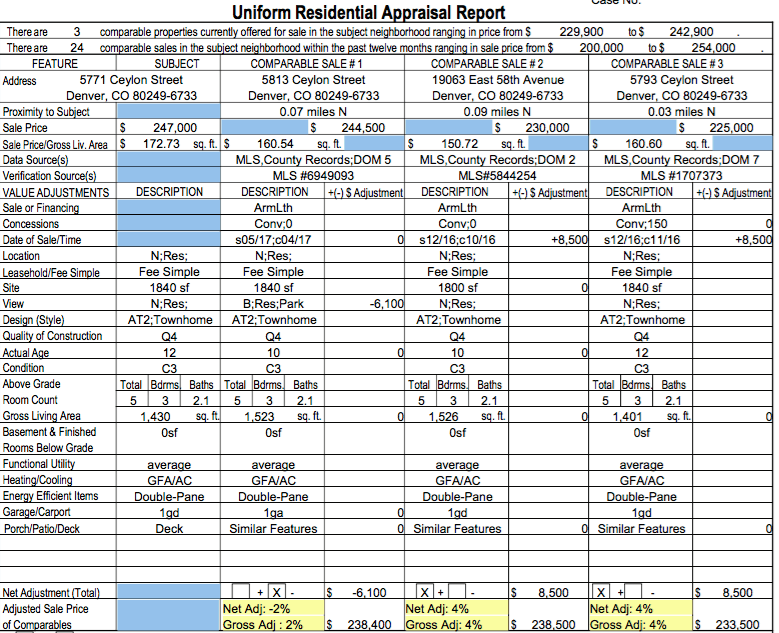 But if the appraisal came in at only $239,000, the lender would loan on only 20% of $239,000 = $191,200. Meaning, the buyer would have to bring $55,800 to the closing table, something he was not interested in doing. I spoke to the listing agent who was very calm and rational (thank god!). He understood what sometimes happens in neighborhoods of escalating prices. Just as importantly, he recognized it would be difficult to convince the appraiser to raise his appraised value, though I totally invited him to try. He asked whether the buyer was willing to stay at $247,000 and I told him he wasn’t. So he spoke to the seller and got back to me later that day with a proposal. He asked whether the buyer would be willing to meet in the middle at $243,000. This would reduce the price by $4,000 (bad for the seller) but meant the buyer would need to bring an additional $3,200 to the table out of his pocket (bad for the buyer). I spoke with the buyer and we discussed the proposal in detail. I told him I thought it was fair and reasonable, and that it was worth considering. I also told him that I felt if he wanted to perhaps come back say $1,000 lower with a purchase price of $242,000 I was guessing the seller would be ok with that. But just guessing, no one really knows. The downside was doing so could begin to rock the deal and mess up badly. There’s pros and cons with everything. Ultimately, it was totally the buyer’s call to decide how to proceed. He asked me what I would do. I told him if it were my purchase, I would agree to the $243,000 and close the deal. Good for everyone, everyone’s happy and the deal gets done. But that’s just me, the bottom line is it was his call. He said he agreed, he was happy with the $243,000 new price (and a cap rate now at 7.2!). I let the listing agent know, we wrote up an Amend/Extend to the contract and closed the deal. Another one on the books! 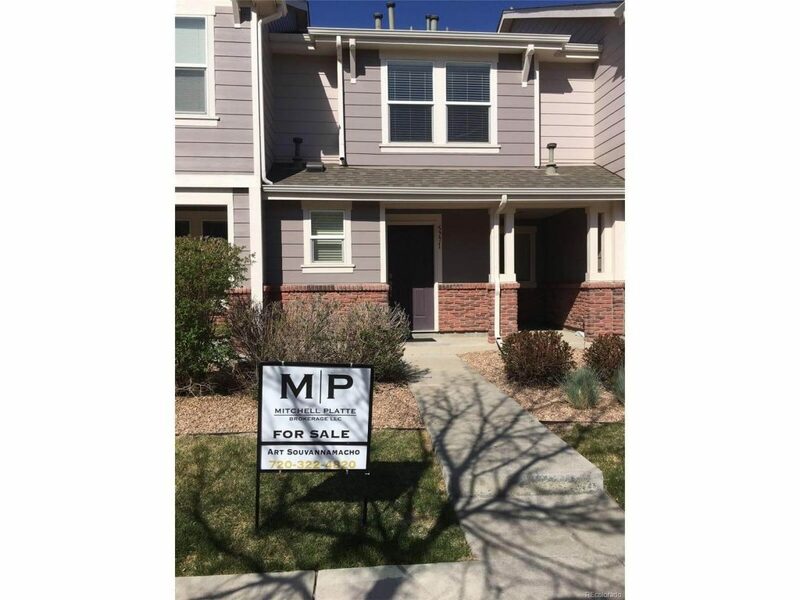 It's always good to hear that an agent that knows what they're doing can still find a good rental in this Denver market! Great stuff guys, keep it up!!! Good investment Charles. Very well laid out case study and proof there is still rentals to be found in the Denver market.